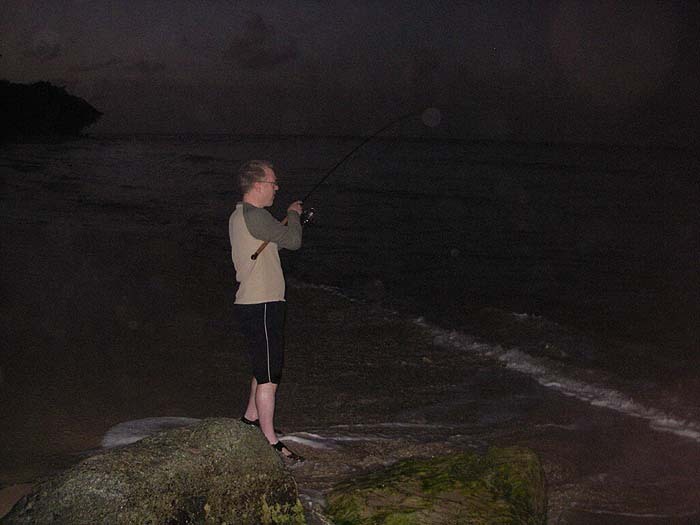 Richard and I have both caught snook before. We like catching snook. These fish run, jump, look impressive, frequently live close to the waters edge and are generally appealing. 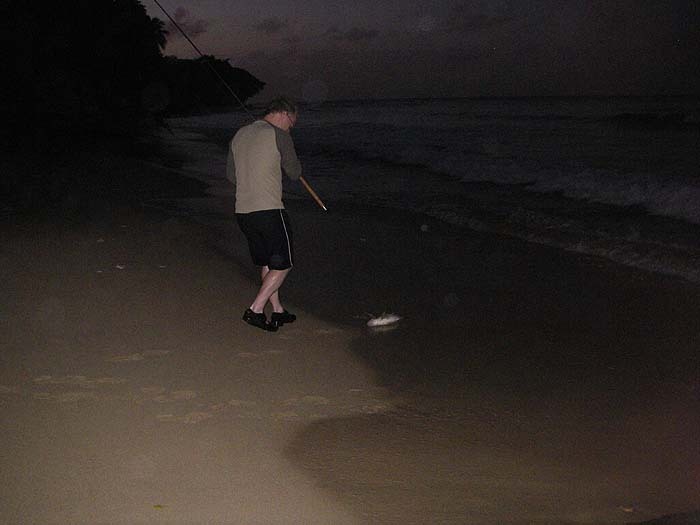 However, on our recent trip to Tobago we caught more than our usual share of these fish. On the first morning after we arrived we were down on the beach as dawn broke. The first thing we did was to make a mistake by walking right instead of left. As the first light glowed in the east it became clear that the feeding pelicans were all at the opposite end of the beach. A half-mile trot/paddle/splash brought us to the scene of the action but typically by the time we got there it looked as though we might be a bit too late. We were both using shallow diving lures about 11-12cm in length and for ten minutes there was no vestige of a bite. We kept flogging away and suddenly my rod crashed over with a savage take. Line screamed off the reel. Was it a tarpon? Was it a jack? We'd no idea. The fish didn't jump or show at all (so probably not tarpon) but for a good five minutes or more it kept making powerful runs against a fairly tight clutch. Eventually I was able to slide my capture through the surf and it turned out to be a snook of about 4kg (nine pounds) - wonderful fish! I scrabbled in the bag to discover our second mistake - no camera. We returned the snook to the sea. By now it was pretty bright (dawn comes quickly in the tropics) so we went back for breakfast well pleased with our first catch. 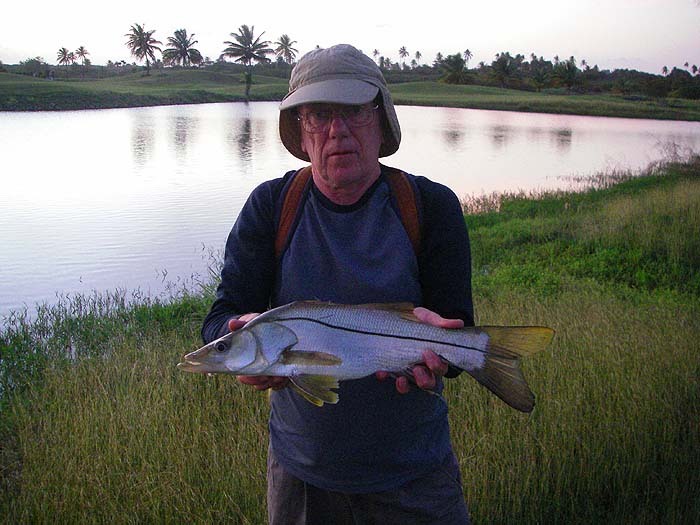 In the course of the holiday we had one or two more snook from the same spot but none were as big as the first one. On this trip, for the first time ever, we were staying in an apartment on a large estate called Tobago Plantations. This development is about ten years old and includes the 'Hilton Hotel' complex which recently closed. 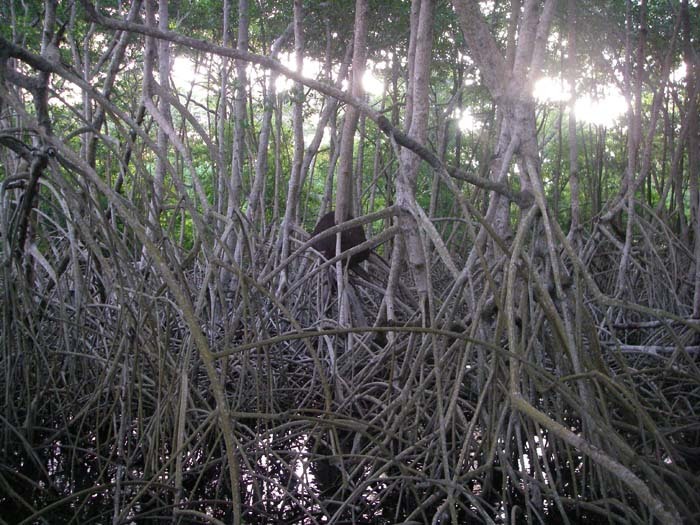 As part of the facilities there is a large golf course, several acres of mangroves and a fair bit of forest rich in birds and plants. On the second day of our trip Rich and Ana went for an exploratory walk in the evening. Richard, of course, took his spinning rod and when he got back he had an interesting tale to tell. On the golf course there are a number of ponds of various sizes. Of course, since the golfers had left, he couldn't resist a chuck with his shallow diving plug and after a few casts he had hooked and landed a mutton snapper of about 7kg (fifteen pounds) - what a turn up! Of course the camera was now in my bag so again no picture. The following evening we couldn't wait to give the pond another try. It wasn't very big (we could almost cast across it with a large Angel Kiss) and the margins consisted of either a shallow grassy strip or a supporting mass of coral boulders. 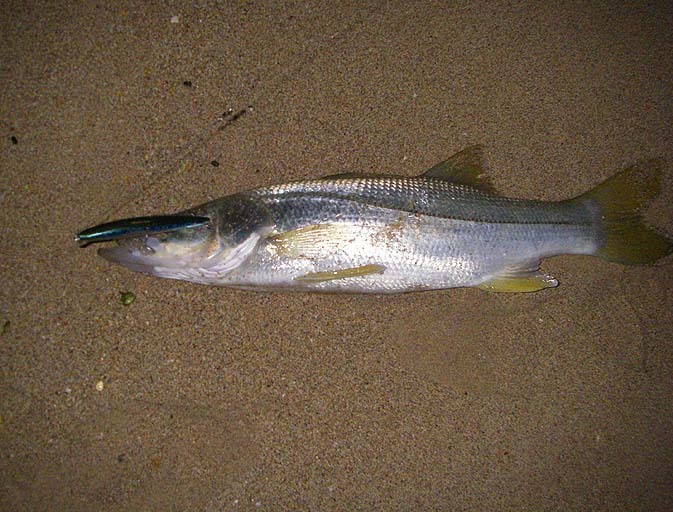 It was not long before we were into fish - not snappers but snook. I suppose that the ones we caught averaged about two kilos apiece and almost all of them were right in the edge (we often disturbed them as we walked round). 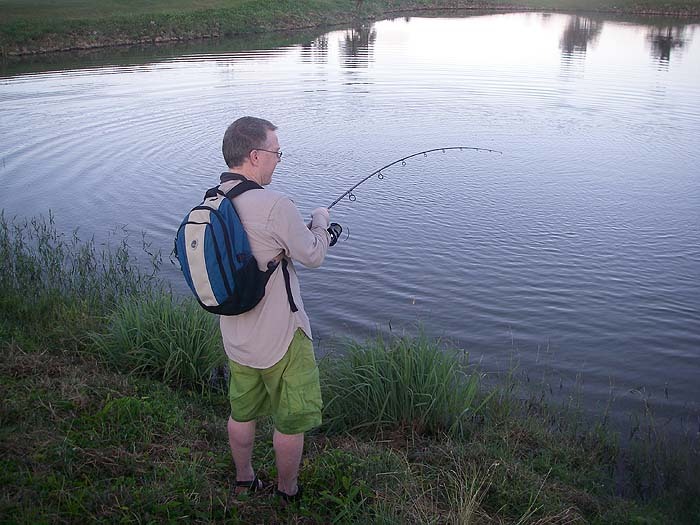 During the holiday we had several fish of between two and four kg but the biggest fish (hooked by Rich) was well over ten kg and after a long battle it wore through the 11kg nylon trace (we didn't think we needed wire in the brackish ponds - wrong again!). In addition to the snook we had tilapia and lost one decent tarpon. It wasn't the sort of fishing that we anticipated but it was easy, productive and interestingly different from the open sea. 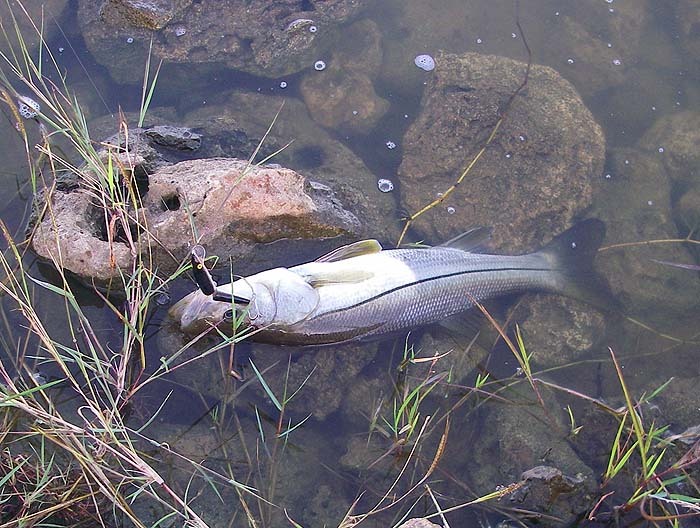 The brackish water snook etc. were certainly lively but nowhere near as difficult to handle as the same species in the saltwater. Anyway, more of our successes and failures on the seashore next time. Richard into a nice snook.